Each one of us will spend many years of our lives working. Why shouldn't we be happy? Sometimes, finding what we really like doing - and what we do well - can involve a lot of trial and error. What if you could learn more about yourself so you could focus on your strengths and interests as you seek out new roles and responsibilities? What if managers and hiring professionals could gain strong insights into their team members and candidates for jobs to find people who fit well in their jobs? We Can - with BestWork DATA! 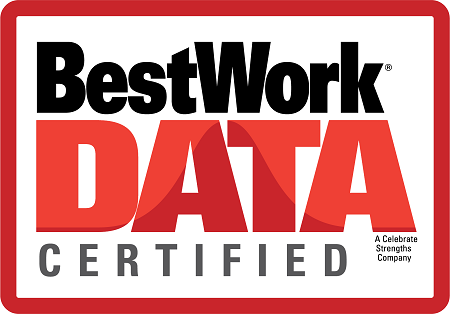 Bizinuum is a proud partner of BestWork DATA, a compelling system that combines a personal traits element along with a cognitive processing section. One part of BestWork DATA measures 6 core personality traits that tend to remain stable over time. These are based upon the Big Five personality model, which is universally regarded as the standard among leading instruments. Each has been found to be directly related to job performance across a wide range of jobs. The cognitive processing section is timed and measures how people process information. BestWork DATA takes less than 30 minutes. The personality traits section is straightforward. The cognitive processing section is designed to be a bit challenging. You have 15 minutes to answer 60 questions. Most people do not get to answer all 60 questions. Some of the problems seem similar to SATs and GREs, but with much less pressure, and only for 15 minutes. If you have questions about BestWork DATA, please contact us.